So our final project for 3D was animating the characters we modeled earlier this semester. I finished early. Not because it was easy, but because I spent a lot of time in there last week at night. People are mad because I’m done because they think it came easy to me and I ran into no problems and theirs is running into all these problems. Well, I ran into the same problems, it’s just I went in two weeks before finals week to work on it, rather than the week before finals week (when everyone else is in the lab). Just because they didn’t see me working several hours on it, doesn’t mean I didn’t. Sorry for the venting. I’m just frustrated with some classmates. My animation isn’t perfect, but with the constraints of the semester, and of the way I created the character, it’s decent. I used to upload these with Google Video, but it doesn’t really exist anymore. I’m a part of an animation network with MyToons and so I’m trying their embedded player to share the animation with you. I hope it’s a good experience. Turn your sound on. If you’re observant, you might have noticed that when you came to milesrausch.com/holli, you got redirected. All is thanks to Miles, as he bought the domain name and hosting as a gift. There will be a redesign, soon. No worries, your RSS feeds, links, and permalinks should all redirect to the new URLs. Even if you linked to a specific post; again, thanks to Miles. Here are my last two paintings for my Painting class. This course was…to say the least…miserable. I don’t want to go into details, but nearly the whole class, if not the whole class, has lost all respect for the professor. In any case, I’m proud of these two pieces. But don’t get me wrong, I am very aware that I am not a painter. I love painting rooms and it seems as though that’s the extent of my emotion. Our final project had to have at least one dimension matching or close to our height. Mine is about 5′ x 3.5′. You can see in the background a classmate, who is 6′, if that helps you with the dimensions. I can’t even fit it in my car, so if I’m going to keep it, I have to walk it home or find someone with a big enough vehicle. 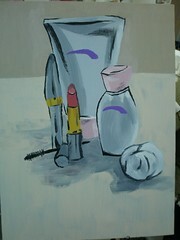 The painting before our final project was a still life, and I wanted to keep some sort of theme, so I brought some of my demo Mary Kay products. These last two paintings had to be in the style of an existing artist, and I chose Paul Cezanne. 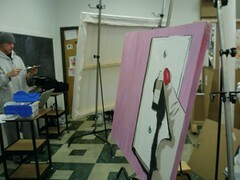 Several of his paintings had the black outline look, with a large emphasis on high contrast values. I wrote this once and something went bonkos with the internet, so here’s the summed up version.Â If you want to watch my graduation speech on Sunday, go to www.dsu.edu on that day and there will be a link to a live streaming video of the commencement.Â The link will be there for two weeks following the ceremony, if you miss it on Sunday.Â The speech is a collaborative effort, with most credit going to Miles and his splendid writing skillz. And to answer the question you all are asking yourselves: No, we aren’t streaming a video of our wedding online.Â Nice try, nerds. 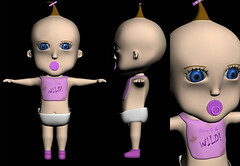 If you haven’t figured it out by now, I have made a 3D model of a baby. I’m really happy with the model; which is a rare occasion, considering I’m a bit of a perfectionist and my own worst critic. I don’t often like my projects when I’m done with them. Of course, there are things I’d like to change, but I’m not dwelling on them because I like it overall. Next, we’ll add a skeleton and animate our models, (many people chose to model aliens, and I find that….weird interesting). This animation may be our final project, considering the time it takes to model and animate anything. And just figuring out how to animate a biped will take much time in itself. So, here’s hoping we don’t have another project for our final. So this is basically my first post about the wedding since we got engaged. Next week, we’ll be three months away. And that’s a little crazy. Out of the weekends in the near future, it looks like the only one that is available is the weekend before I graduate. It makes me stressed out. I wouldn’t say that I get stressed out easily, I just have enough going on in my life all the time that I’m stressed often. I know a lot of this will pass in a couple weeks, because I’ll be motivated again, once the middle of the semester has passed. I am very excited for the wedding. We have some great things planned, and are still planning some great things.Â I just need a little more time in each day.